Are you sick of hearing about Passover/Pesach yet? Well bad news folks, Passover is not for another week, so y0u’ve got another two weeks of hearing about my Passover cooking. On the other hand, if you think it’s bad, imagine what kind of separation anxiety I am feeling for my best friend, er, I mean my Kitchen Aid. I’ve noticed that my Smashed Potatoes, even though I posted them ages ago, have gotten quite some traffic lately. Want to know why? It’s simple. They’re delicious. They’re easy. And they’re completely doable for Passover. (Except, of course, if your custom – like mine- is to use no spices, and no garlic. Then you’re stuck.) 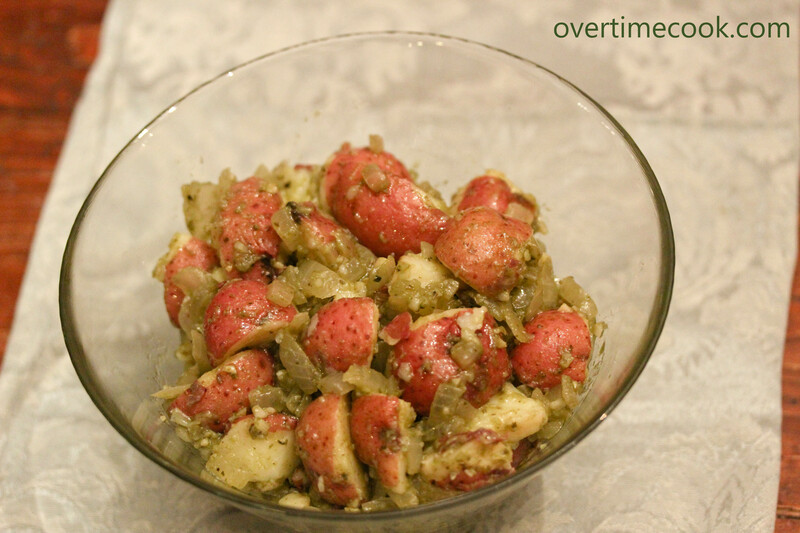 Here’s another delicious potato recipe. It’s delicious any time, Passover or not. It happens to be Passover friendly, but it also happens to be delicious. Like, you should totally make this for a summer picnic kind of delicious. Oh, and FYI: I hate potato salad. I know, it’s weird, cause I usually love anything carby, but I really can’t stand it. Something about the textures, the taste, or the combination of all of them. This is not a typical potato salad. In fact, it’s really only called a potato salad because I came up with the recipe at about 1 am, and my creative juices has run dry. Desperate, I scribbled “basil potato salad” in my little recipe notebook, and the name stuck. Boil the potatoes in salted water until just tender. Drain the water and set potatoes aside. While the potatoes are boiling, finely dice the onion and mince the garlic. Saute in olive oil on a medium flame. Add the chopped basil, salt, pepper. Saute until vegetables are limp and translucent. Cut potatoes into halves or quarters, depending on the size. Add the chopped potatoes to the vegetable mixture. Toss to coat the potatoes. Remove from heat. *Note about the basil- I used the frozen basil cubes, 3 equal a Tablespoon of chopped basil. If you are using fresh leaves, you should probably blend the leaves and the oil together, then proceed with frying the onion and garlic. Can you provide a link to the smashed potato recipe? Oops! Left it out. I added it above. Some of that traffic on the smashed potatoes is definitely from me. 🙂 And are you kidding? If you posted about something other than Pesach, I’d lose interest. But anything Pesach-friendly is perfect these days. I’ve also been playing with potato salad recipes recently and love your idea to make a basil one. My Mom was known at family gatherings for her potato salad. I’ve never been a fan of any potato salad, hers included. 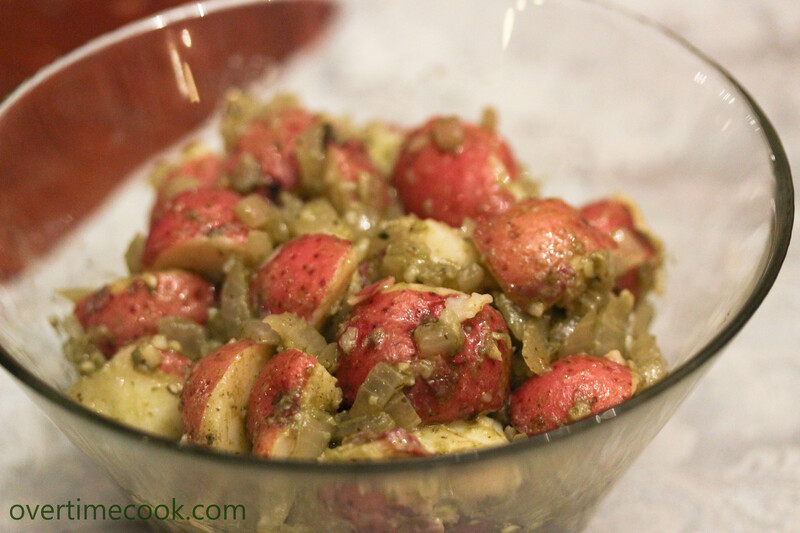 I will say however that your Basil Potato salad looks like something I’d enjoy. Can u use dry basil?